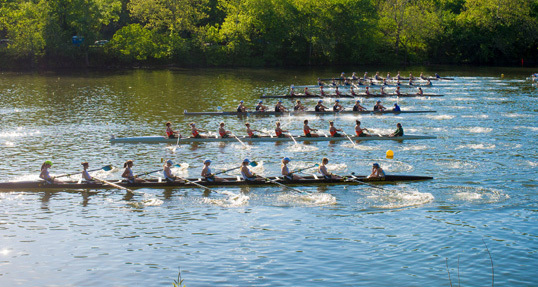 PRINCETON, N.J. — University of Washington had a strong weekend of racing and was the consensus pick as the top Division I program in the third USRowing/Collegiate Rowing Coaches Association Division I, II and III Collegiate Rowing Polls, presented by Pocock Racing Shells. Washington won all seven of its races against UCLA, University of Oregon and Washington State University Saturday morning on Dexter Lake, Ore. to earn all 25 first-place votes. The University of California, Berkeley ranked second after winning 13 of 13 races at the Lake Natoma Invitational. Following last week’s rankings, University of Michigan was third, the Ohio State University fourth and University of Texas fifth. In the DII poll, Western Washington reclaimed sole possession of its number one ranking and earned three first-place votes. The Vikings are looking to take home another win Saturday, April 15 at the Covered Bridge Regatta. Ranked second in the DII poll was Florida Institute of Technology who’s winning finish in the club eight at the Knecht Cup on Mercer Lake, N.J. earned them two first-place votes. University of Central Oklahoma and Humboldt State University maintained their places at third and fourth respectively. Barry University rounded out the top five, moving up one place from last week’s poll. Division III Bates College took six first-place votes, leading the pack after its top two eights swept a four-team field on Lake Quinsigamond in Worcester, Mass. Bates beat Wellesley College, Worcester Polytechnic, and Trinity College. Wesleyan University ranks second with three first-place votes and Williams College finished third. Wellesley College and Ithaca College (one first-place vote) completed the top five. Click here for past poll results.